My gym shorts, I love them. They come complete with side chasm and internally hidden granny pants. Gym, printed, green, chasms, granny, Nike. Cherish. Treasure. But alas, in every sentence typifying the PEE sentence structure, (that's point, evidence, explanation, not a dismissive toilet break) therein will lie an operative word. GYM. Cherish, yes. Wear for purposes exclusive of sweat-enducing glute-destroying inhuman movement? By golly, no. Sport luxe. Vom. Gym shorts, but not in the gym? Vom again. By no means have I ever considered myself a member of the sport luxe tribe; I look as out of place in a wedged trainer as a kangaroo in a pet shop, all pouch-bearing and predatory locomotion. (Have you ever seen the way they move, by the way? Suffice to say that I run forest, run.) Repel is what we do; two components producing intrinsic repelling force. I put wedged trainers on and the jeans follow, after which the unsuitability of the whole outfit to my sartorial soul begins to snowball out of control. SS12 threw us a tricky trend: the white out. White white white white white. Can't get enough of it. Cue unnerving images rising from the hidden banks of the subconscious - flared white jeans circa 1998. Delete. Start again. Cue, instead, beautiful sequin chiffon dress from Helmut Lang. It's quite sporty, no? Ah, not so bad. And so, I experimented further, drifting further from the borders of my comfort zone, feeding white and sport into my wardrobe via intravenous liquid substance: cue a waterproof hooded jacket and some Wang. The yellow? Well, you didn't expect me to go all-white all-weady? Steady on. A little quirk goes a long way. White sport luxe plastic parka from Topshop. 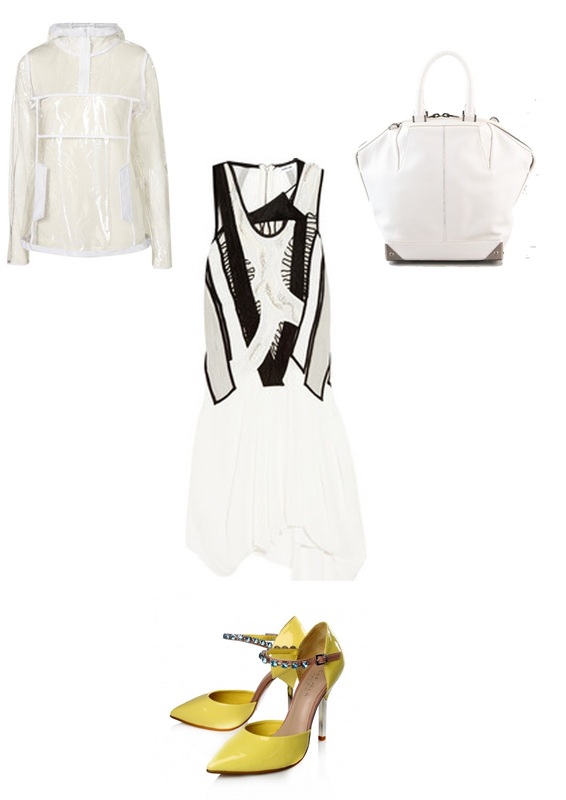 Black and white dress from Helmut Lang at net-a-porter.com. Emile tote by Alexander Wang. Offbeat yellow shoes from Carvela.